30 Americans at Tacoma Art Museum (TAM) is an exhibit that sparks immediate and inevitable conversations, and the conversations can be contentious. And the curator meant it to be that way. The exhibit, organized by the Rubell Family Collection in Miami, takes on the increasingly important and pervasive topics of race, gender and history, as seen through the eyes of several prominent African-American contemporary artists. While 30 Americans has been shown in nearly a dozen cities as culturally varied as Washington D.C., Nashville, Raleigh, Detroit, Miami and New Orleans, TAM’s installation is different. It is the only museum in which two particular individual works are displayed in such a way that they are seen as pieces of a bigger message, and it’s a message that can be interpreted as astute, abrasive, offensive or anything in between. Anything except coincidental, that is. As one enters the main gallery, front and center is a circle of schoolhouse stools, each with a Ku Klux Klansman’s hood resting empty but upright on the seat. The stools are circled around a rope tied into an empty noose that’s suspended from the ceiling. This piece, called Duck, Duck, Noose by Gary Simmons, is visually jarring on its own, juxtaposing a children’s game with some of the most heinous objects from the adult world. But beyond the noose – and actually viewed through the noose – is a flickering black and white neon sign declaring “America” in bold, capital letters. 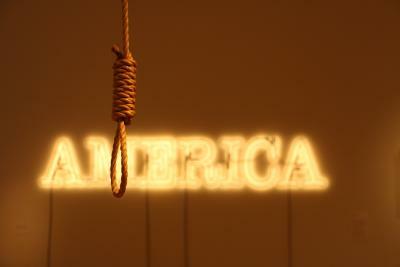 The neon sign, titled America by Glenn Ligon, provides the effect is that the first thing visitors see as they enter is “America,” partially inside and partially obscured by a hangman’s knot. The role of the curator could not be more important, or more visible, than it is in 30 Americans. TAM’s chief curator Rock Hushka chose to confront visitors with these pieces, in this order, in this space. 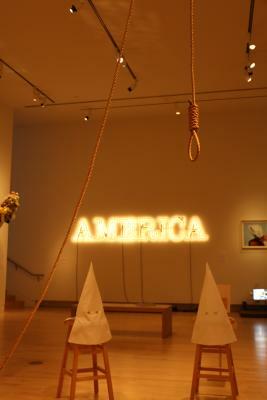 Where in several other museums that have shown 30 Americans, Duck, Duck, Noose has been displayed in a darkened corner of the gallery using spotlights for effect, Hushka leaves it fully in the light, and places America boldly in the background. In doing so, Hushka embraces the role of the curator as a guide in interpreting and contextualizing the art. Apart from the artist, few people can play such a role in the way the public experiences art, and he plays it masterfully. The other pieces in the collection range from satirical, powerful, provocative, informative and bewildering. The exhibit contains some of the largest pieces TAM has ever had on display - Kehinde Wiley’s Sleep measures 11’ x 25’ and inhabits an entire wall of the gallery. But the piece that you’re going to be talking about on the way home, and possibly for the following week, is actually two pieces, deftly worked into one by a curator with a vision. The installation at TAM marks the 30 Americans West Coast debut, and is currently its only scheduled stop west of the Mississippi. 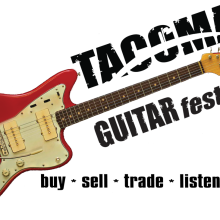 It’s on display at Tacoma Art Museum through Jan. 15, 2017.